As many of you probably guessed, today was bound to be a better day than yesterday. I am pleased to report that we've had piles of fun, Elise is currently sound asleep for her nap, and I'm about to get off my lazy behind and get the house straightened up a bit in honor of the impending visit of a potential new babysitter. Wahoo! This morning, Elise was determined to prove she was in a happier mood, and she did so by asking Andy if she could sit on his lap as he drank his coffee. He said yes and she ran around to the other side of the table. What?! 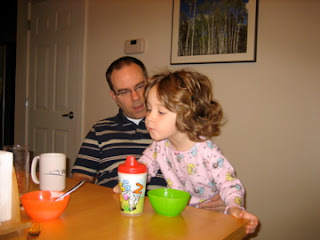 Oh, that's because she wanted to shift her bowl of Cheerios closer to Daddy so she could eat and snuggle at the same time. And then she asked for yet another "story about when you were a little boy." It was cute. Our big accomplishment of the morning was to make a nice, visible schedule for Elise. She gets in the habit of not knowing what's going on from one minute to the next and then ends up kvetching about everything. I figure that with a schedule it all looks written in stone (or at least brightly colored shapes) and she'll be better at anticipating. And maybe whining less. We had great fun working on this together, and it ended up taking most of the morning. Much more fun than the "muck out the garage" plan I'd hatched earlier. So, here you can see our newly upgraded family command center. 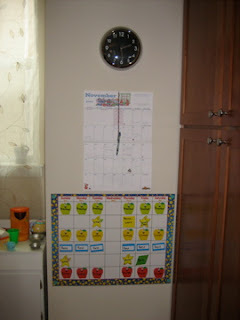 Clock, family calendar, Elise schedule. And the good news is that from a distance I can even see what's on this chart. I can be more organized too! 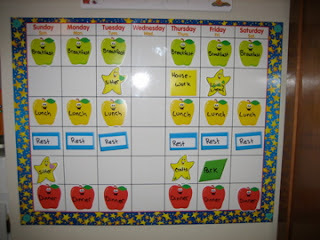 I have also managed to schedule three whole preschool visits (at places with openings!) for next week when the sitter will be here, so with any luck I'll have some good news on that front in a week's time. Here's hoping the afternoon and evening go as well as the morning has. Oy! Sounds like you have a very hungry brain on your hands. The kiddo is demanding to know what's going on, choice over what happens and control of those things that deal directly with her. 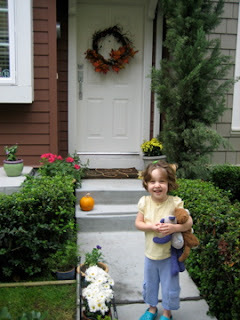 Preschool, calendars and new sitters with new and interesting activities are probably going to go over swimmingly. It should be enough new info for her little brain to chew on. Way to handle the trying kiddo. You sound like a pro! (BTW, we have some Poms at work who finally experienced the TV show "The Nanny" for the first time this week. They were horrified at the load of crap it is; I was horrified that it's made it to NZ TV; we all agreed that the only reason it hasn't made it to the UK is because the nannies are the worst British stereotypes we've all seen. I only mention that because your persistence and success with the time-out rule reminded me of the show. That seemed to be the only thing of any substance oozing into the looping clips of children running amok).